At Ocean Quest Spa in Conception Bay South, hidden near the natural beauty of our seaside surroundings, we strive to bring you a feeling of peace and serenity. Our spa presents a diverse menu of nourishing skin treatments that awaken a sense of calm and rejuvenation. We use local ingredients from the land and sea to hydrate, refresh, and heighten the senses, invoking tranquility of our beachy shorelines in our private treatment rooms. Our attentive, professional, caring estheticians will ensure you receive personalized, targeted care for your individual skin concerns while providing an extremely luxurious experience. 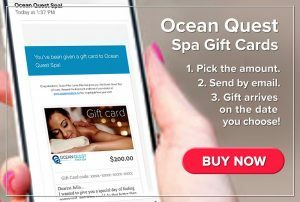 Come to Ocean Quest Spa. The Sea Beckons You.